Writing is seen as a tool for learning as well as a product to be assessed. The importance of what you yourself can bring as a writer to your academic writing is stressed throughout the book.The book looks at an array of writing projects, including essays, reports and dissertations, and analyzes what is expected of each form of assignment. 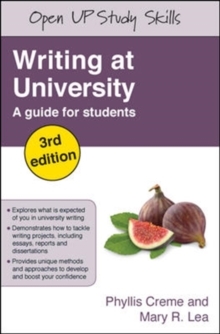 The authors provide examples of student writing and reflections on writing by both tutors and students.This edition includes new sections on:Making an argument and persuading your readerUsing sources creativelyAvoiding plagiarismWriting onlineFurther sources of information about academic writingWriting at University is an essential resource for all college and university students, including postgraduates, who wish to develop their academic writing. It will also be an invaluable aid for tutors in supporting their students.